I know... you're thinking that the last thing you need right now is another recipe. I'm sure you've all got your plates full (pun intended, ha) with food to cook for tomorrow. But what about tomorrow's breakfast? And no, I'm so not going to let you get away with the whole "I skip breakfast so I can eat a big meal later" story. You know you want something delish to eat while you're slaving away in the kitchen tomorrow morning, right? Can I get an amen? These little guys may not look like much (especially with my horrible food photography- where's Tiffany when you need her?! ), but they are scrumptious. I made them last weekend for a family brunch that David I hosted here at our casa. My brother-in-law, soon-to-be sister-in-law and her sister and husband (got all that?) brought their sweet new little girl over to meet H Dawg. She's about six weeks old, so it was a cute baby fest, that's for sure. 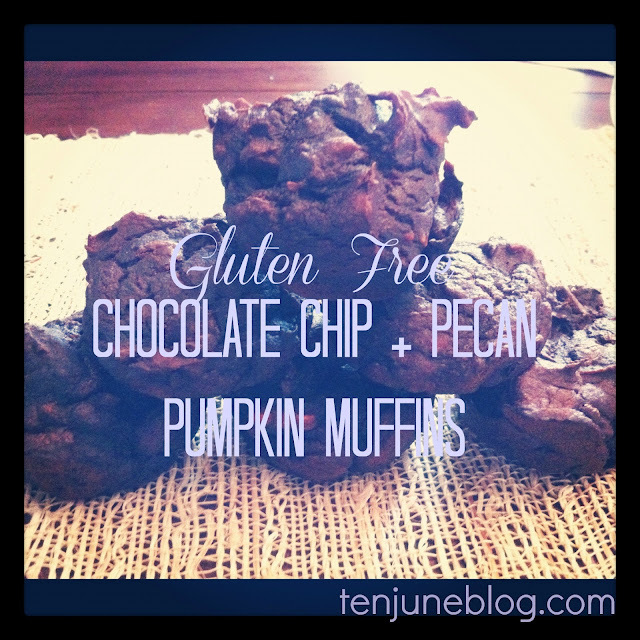 My soon-to-be sister-in-law has a gluten free diet, so I made these muffins especially for her. I think they were a hit! And the best part? They are so easy. 1. Dump all of the ingredients together. 2. Bake according to cake box directions for muffins. I erred on the overdone side, just because pumpkin is so moist it's difficult to cook. I didn't want the muffins to seem undercooked in the middle so I over-baked them a tad. I told you... pretty easy! And if you leave out the chocolate chips, these are dairy free treats as well. Thanks for sharing! My dad is gluten free and I'm always on the lookout for new recipes! You're so sweet Michelle, and those are so delicious! Amen sista! Nothing like something with chocolate for breakfast! I will have to try those! Thanks for the sweet mention!! Happy Thanksgiving! Truly, Tiffany's photos are TOO good. I love them always. This recipe looks delish. YUM!